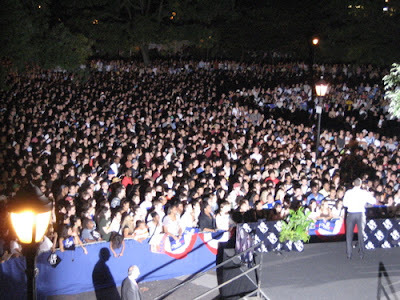 Its more than a year before the election and this is the size of the crowd at a political rally. People are engaged in politics again, and thats a good thing. A really good thing. It also is the reason the beltway Democrats look like spineless cowards. As usual they are behind the times. They think people aren't keeping track of what the are doing or rather what they are not doing. They couldn't be more wrong. They think they can just smile and make some murmuring noises and go harrumph, harrumph that we will be appeased. Look at the size of that crowd. Yes, they went to see Obama, but what they are looking for is change. They believe they are looking at the future. It doesn't involve spineless, do nothing, go along with Bush Democrats.